Not quite a cracker, not quite a flatbread…you can imagine the amount of restraint it required not to entitle this post “crack bread”, especially considering how good they taste. Although this is not exactly bread, and therefore not really fulfilling one of my new year’s food resolutions, I think this is a good intro to the world of unleavened, savory baked goods at the very least. Give me some credit – it’s only been two weeks. This recipe went through three evolutions: the little-bit-naughty one, an extremely healthy, birdseed style version, and what I am presenting you with today: the very happy medium. The inspiration for the recipe came from the humble flax seed – one of those food items that has received massive attention in the past couple years for its explosively high content of Omega-3 Fatty Acids. However, there is yet another powerful aspect to this seed, a component in the shell itself, called a lignan. What in the world is a lignan? Lignans are special compounds found in flax and in other seeds, grains, and legumes that are converted by beneficial gut flora (re: probiotics) into two hormone-like substances called enterolactone and enterodiol. These hormone-like agents demonstrate a number of protective effects against breast cancer and are believed to be one reason a vegetarian diet is associated with a lower risk for breast cancer. In animal studies conducted to evaluate lignans’ beneficial effect, supplementing a high-fat diet with flaxseed flour (like in the recipe below, for example) reduced early markers for mammary (breast) cancer in laboratory animals by more than 55%. What else do lignans do, Sarah? I’m glad you asked that. The lignan-rich fiber found in flax meal (ground flax seeds) has also been shown to decrease insulin resistance, which, in turn, reduces bio-available estrogen, which also lessens breast cancer risk. And, as insulin resistance is an early warning sign for type 2 diabetes, flaxseed may also provide protection against this disease. Groovy. So here’s the recipe that I’ve been working on, adapted from an old issue of Gourmet. If you choose to ignore all that incredibly valuable information I just spewed out, by all means omit that flax meal for a real treat (a.k.a. crack bread). However, if you would like to take advantage of all the benefits flax seeds have to offer, I suggest that you grind your flax fresh as the delicate fats (those good ol’ omega 3’s) are extremely sensitive to heat and light and go rancid super fast. If you must buy it pre-ground, find it in refrigerated/freezer section of your grocer, preferably in a lightproof vacuum-sealed bag, and check the expiry date. Making your own at home when you need it will ensure absolute freshness. Whole flax seeds on their own last a very long time, but once you crack them open their shelf life declines considerably. Store any extra in the freezer. You can purchase golden or brown flax seeds (I used golden in this version) – they are nutritionally equal. As for the salt, I went with a delectable smoked sea salt (pictured. 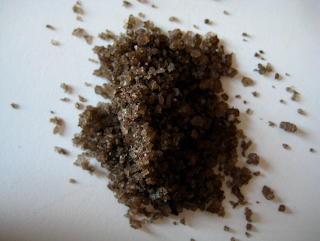 Yes, that is the real colour) to enhance the richness, but any high-quality sea salt is fine. You can find various salts at specialty gourmet shops and health food stores – this is a great opportunity to try something new! These flatbreads / crackers / crisps are rich and nutty-tasting with a seriously luscious flakiness. These would superb as a bed for black olive tapenade, or roasted red pepper hummus. If you’re into dairy, a soft-ripened cheese would be delightful I bet. The rustic, free form shapes created simply by breaking the large rounds into pieces, lend a certain informality to a distinctively sophisticated flavour. Oh my. 1. Preheat oven to 450°F with a heavy baking sheet on rack in middle. 2. Grind flax seeds in a coffee grinder or blender until all seeds are pulverized. It should resemble flour. 3. 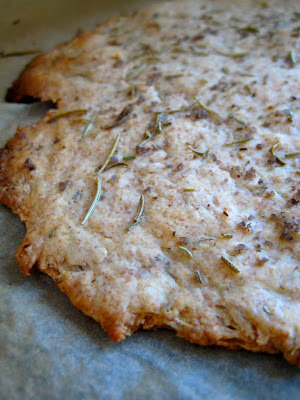 Stir together flour, flax meal, chopped rosemary, baking powder, and salt in a medium bowl. Make a well in center, then add water and oil and gradually stir into flour with a wooden spoon until a dough forms. Knead dough gently in the bowl 4 or 5 times until it comes together. 4. Divide dough into 3 pieces and roll out 1 piece (keep remaining pieces covered with plastic wrap) on a sheet of parchment paper into a 10-inch round (shape can be rustic; dough should be thin). 5. Scatter small clusters of rosemary leaves and a little salt, pressing in slightly, then lightly brush top with additional oil. Slide round (still on parchment) onto preheated baking sheet and bake until pale golden and browned in spots, 8 to 10 minutes. Transfer flatbread a rack to cool, then make 2 more rounds (1 at a time) on parchment (do not oil or salt until just before baking). Break into pieces and serve. I recently graduated college and after grocery shopping for the first time on my own, I have started caring a lot about my heatlh and what I put into my body. I was definitely a soy and pasta vegetarian for a few years. Your blog has been such an inspiration and has helped me come up with countless ways to use ingredients and feed myself! I was wondering if I could substitute whole wheat flour for spelt? Is there a big difference in how these will come out? I’ve heard that baking flax seeds ruins the lovely oils which boast so many benefits, is this true? I’ve been wondering the very same thing…..??? Not sure if anyone is monitoring this comment forum as I see few answers to questions posted. Does anyone else have informed insight about this relevant question? I’m a huge sucker for baked goods, but that usually means I feel pretty terrible after over indulging on carbs – yuck. This is by far the most delicious bread(?) I have ever made and quite possibly the best I have ever eaten. The very best part? I felt great and was satisfied, too! I wish I had doubled the recipe because it was gone in literally 10 minutes (thanks, loving husband). I had some almond hummus on hand so we used it as flatbread… an interesting mix, but still delicious. As always, thank you for your incredible recipes and inspirations!!! I just made these and they’re wonderful. Thank you for sharing this recipe! I made these and they were de-lish!